Through April 14, IHOP Kid Chef Champion Brody Simoncini’s limited edition pancake can still be found on IHOP menus nationwide. $1 of every sale of a full stack or combo of Brody’s pancake, the OREO® Oh My Goodness Pancake, will benefit the local Children’s Miracle Network Hospital or other IHOP charity partner. For the Simoncini family, this pancake recipe holds a special meaning. Born with a rare abdominal wall defect, Brody underwent multiple lifesaving surgeries over the course of five years, including open heart surgery and an induced coma. For the first few years of his life, he was on a feeding tube and required therapy to learn to eat on his own. OREO cookies were the first solid food that Brody was able to eat. Today, he’s a healthy, active first-grader, and the newest IHOP Kid Chef Champion. All throughout the month of March, Brody celebrated his win as the IHOP Kid Chef Champion. General Manager Joe Pine helps Brody Simoncini, 6, of Worcester, Mass. make his award-winning OREO® Oh My Goodness Pancakes on Thursday, March 7, 2019 at the IHOP in Northborough, Mass. 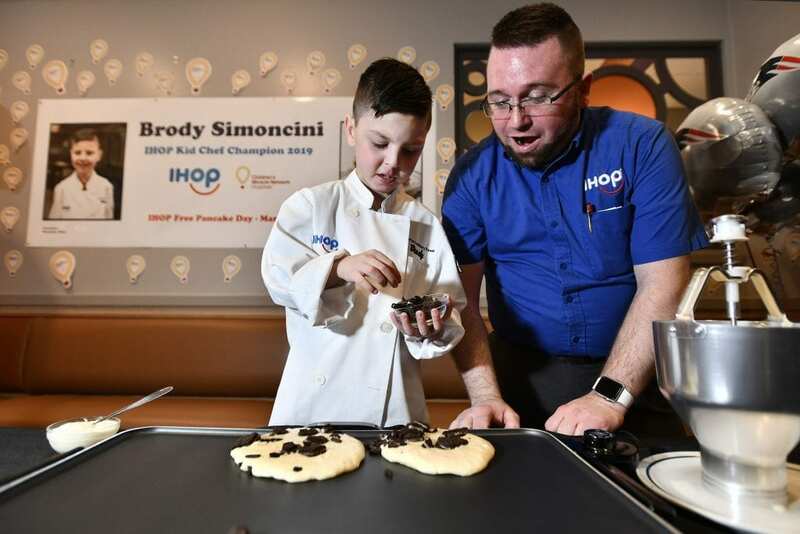 Simoncini was named this year’s IHOP Kid Chef Champion as part of the brand’s Free Pancake Day event taking place in IHOP restaurants nationwide on Tuesday, March 12 and benefiting Children’s Miracle Network Hospitals. (Josh Reynolds/AP Images for IHOP). IHOP hosted a friends and family party at his local IHOP in Worcester, MA where Brody demonstrated how to make his pancake. 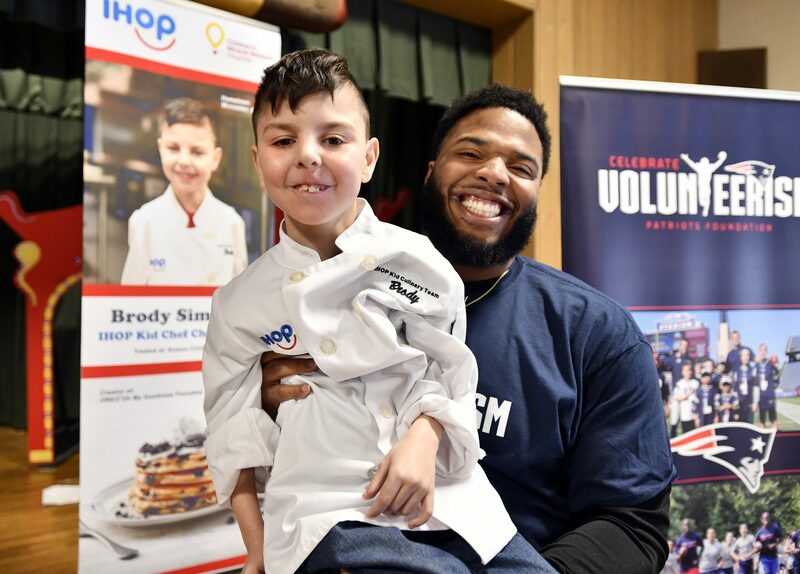 The next day, Isaiah Wynn, offensive tackle with the New England Patriots surprised Brody at his school to celebrate Simoncini’s win as the IHOP Kid Chef Champion. Wynn read a book to Brody’s class and had a few special surprises to share with him—including signing a copy of his limited-time menu insert. On IHOP Free Pancake Day, Brody and his mom Maureen were in New York City to appear live on Fox & Friends. 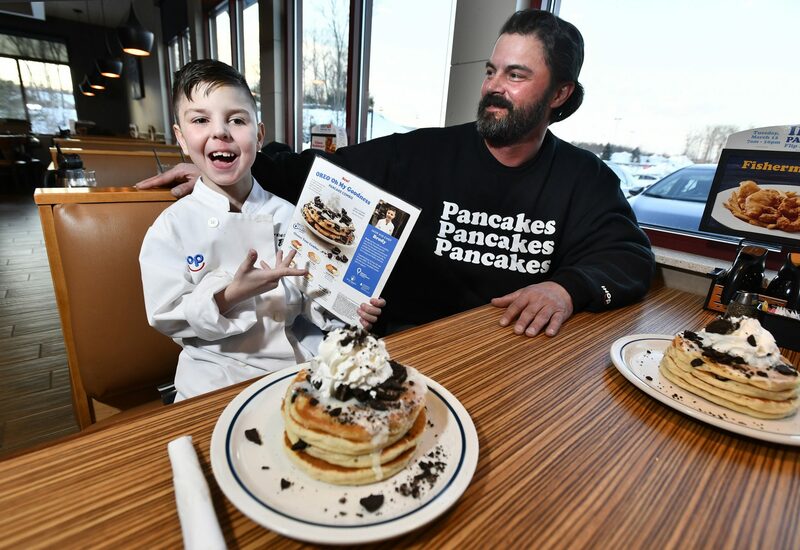 Maureen shared Brody’s story as a pediatric patient at Boston Children’s Hospital while Brody topped his OREO pancakes with whipped cream and cookie pieces. 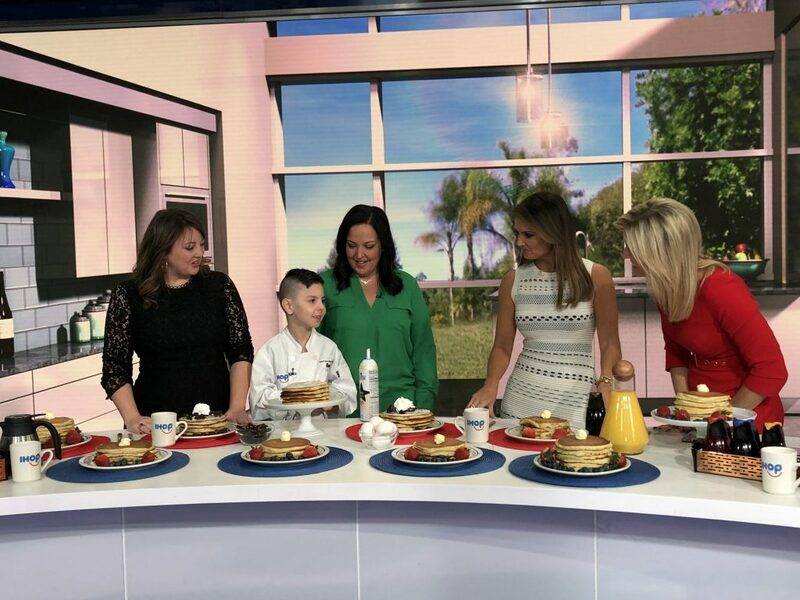 Finally, Brody and his family traveled to Orlando, FL to take part in Children’s Hospitals Week where his signature pancake was served during a gala dinner and he was recognized during the Live-athon broadcast designed to bring awareness to the needs of children’s hospitals like Brody’s. Congratulations Brody, the 2019 IHOP Kid Chef Champion.